This is a dedicated self-feeding chipper that will chip hardwood branches up to 3.75" in diameter. It's easy to maneuver by hand, but we also offer an optional pin hitch kit for towing around your property. The PREMIER 375 is our smallest dedicated chipper, but it packs a serious punch. DR Self-Feeding design allows it to tear through branches up to 3.75” in diameter, and do it continuously...without bogging down the way underpowered “big box” machines do. An easy-grip handle bar makes for a convenient way to maneuver the PREMIER 375 Chipper by hand. You can also add an optional pin-hitch kit that lets you hook up to your lawn tractor or ATV and tow the PREMIER model around your property. A large vertically oriented hopper, a precisely-angled heavy-duty chipping knife, and a powerful air channel work together to pull branches into the chipping hopper and blast wood chips out the discharge. Most materials will self-feed, so once you drop a branch in your free to get the next one. No force feeding required! Our big chipping hoppers will accept whole armfuls of small branches at branches at once, or even whole trees and saplings — with little or no trimming of side branches. This saves tremendously on the time you spend pruning and preparing materials for chipping. The key to efficient wood chipping is the rotating mass created by the flywheel on which the chipper knife is mounted. The PREMIER 375 Self-Feeding model features a 14” diameter flywheel that’s a half-inch thick and weighs a hefty 25 pounds. It spins at 101 mph and takes an amazing 40 “bites” per second! The legendary power, performance and durability of Briggs & Stratton® engines make them the only ones we use on our DR Chippers. The PREMIER 375 Self-Feeding Chipper uses a durable 7.0 HP (11.5 ft-lbs gross torque*) Overhead Valve, easy-starting engine. It features a debris management system that protects the engine from whatever you kick up while you’re chipping and shredding. Made of high-carbon/high-chromium forged alloy tool steel, our knives hold an edge longer than those on "bargain" chippers.. Still, as with any cutting tool, keeping a sharp edge is important for maintaining peak performance. We recommend keeping an extra on hand so you can minimize downtime. Hopper Opening Size 14.5" x 23.5"
Outstanding chipper. Surprised how small and lightweight it is compared to how powerful it is. Chips to the size advertised with no issues. A little cumbersome to move around because the wheels are short and the axle is narrow. Little more difficult for taller folks 6 foot and tallerbecause of the handle position is somewhat low to the ground. No issues with tensioning the belt after the first hour, but there was some rubbing by the axle under the black guard, so it might be smart to check that initially before running for the first time. Self Feeding option works great and is crucial. It would much more inefficient without that option. I wish I had purchased this a few years ago. No need for any larger model anything that can't be chipped by it is plenty big enough for the fireplace. Far easier to chip freshly cut wood then old stuff, because the self feeding option works better with green wood. I’ve only used the chipper for about three hours now It works pretty good but does not work very good on branches over 2.5 inches and up it bogs down even when you feed it slowly should have spent a little bit more and bought a commercial one. Live and learn. Just used my new wood chipper for the first time. This is a real work horse. I clean all the fall trimming in one hour time. The chips make enough mulch that I don't have to buy. Now I don't have to send all my tree cutting to the local land fill. If you have trees you need this wood chipper. Great job. I have 40 acres in Cleveland County NC and was tired of having large piles of brush making the place look bad. This machine is big enough to clear most of the brush piles and small enough to transport easily. Good combination of power and portability. This is a very capable chipper and does the job as advertised. Our only problem with it is the wheel-base is a little short for our operations in a big maple grove. If we tow the chipper behind our ATV in the woods, it can tip over. Instead, we load it on the pallet forks of our tractor and transport it that way. Love the chipper. It has been working well. I also enjoy the way the chipper is build: Strong. Chipper was pretty straightforward to set up and works well on smaller diameter branches but it needs to be fed gently if the branches get near the max diameter. Seems to be very solid and well made. Only criticism has been made by many others - some small parts lock nuts were missing. It can't be that hard to count to 7, but apparently it is. Contacted C/S and they sent missing ones, but one of those was the wrong size even though the packing list was correct. Just annoying and i assume no reason but carelessness in the warehouse. Took this machine to our mountain property to do some clean up, it ate everything I fed it. It starts with one pull every time, I did plug it up once, but that was my fault. Easy to unplug. Very heavy duty machine. This chipper is a beast! I have to admit, I was a little disappointed that the chipper is smaller in size than I thought it would be. Regardless, this thing is a beast. It chews up branch after branch, and I’m really happy with how it performs. I’ve pushed the branch size limit a time or two, and it just keeps on chewing. Really nice machine. I’d highly recommend this wood chipper. Pleased with chipper so far. I picked up the chipper from the freight company.Then assembled it the next day, added fuel and oil.On the next day I chipped about a half utility trailer load of brush. And now have mulch for my flower bed. The machine performed great. I am very happy with this little machine. Great machine. Easy to assemble and started on first pull. Chips really well and easy to move around. I use the wood chips to fill in low spots in the yard. I blow them directly into a wheel barrow and wheel it to a low spot. I could have given it 5 stars except for two things: First, it was not boxed & packed appropriate for shipping. The air cleaner cover was shattered & there were some dings & scrapes on machine. Second, I was missing several nuts for the assembly. I had to use the shipping nuts, which it said to discard, as I didn't have extra nuts in that size. Also, when attaching the hopper, it was impossible to fit a washer under the lower bolt on the right, due to a manufacturing glitch. The hopper sits directly against where the bolt is to attach. There is barely enough space to attach & screw in the bolt no room for a washer at all. Other than these glitches, the chipper performs well. Bought this around 8 months ago I looked at a LOT!!! Of chippers out there hands down this is the most heaven duty of this size out there, checked competition units cheep light weight junk as there reviews show, there fly wheels on the competition are 1/2 if not Less thick as this one, the cutting blades are HEAVEY DUTY on this DR unit the competition has very thin ones no way they will hold up like my DR chipper, every spinning part has a heavy duty bearing no a bushing like other ones I looked at, i have the pull start model but starts very easy, I have chopped up 3” logs just to see if it would do it as they say it would, you have to take your time but it will do it, no issue, cut down 12 large trees and chipped all the tops up and used the chips around the property for low spots, runs and works great, chips great, they are a little more expensive but with this this chipper you do get what you pay for . I believe this is going to last a life time can’t see were it will fail yet, If your in the market this is the one trust me this is the one to buy and no I don’t work for or know anyone at the company Hope this help you make the right decision. The motor starts easily and runs a long time on a tank of gas. The chipper mechanism works great handling small branches and most larger branches easily. My only suggestion for improvement would be to replace the small wheels and tires with larger ones and widen the spacing between them to improve stability. I am very pleased with its ability to chip ,even whole trees. I have 10 acres of very steep slopes so I mounted it on another trailer for stability. I may widen the axle (Rocky Mountain Edition). The chipper is great. Will self feed but there cant be a lot of side branches or you will have to help it some witch is to be expected. I have chipped 6 or 7yrds of different types of limbs and it does it all nicely, on the real big stuff don't try and force it just let it work for you and cut the limbs in 4' or so although it will take a big limb 10 or 12ft. long but just don't let the chipper take it to fast listen to motor and work according to the sound of engine RPM. The only reason I'm giving 4 stars instead of five is because I thought the shipping was a bit confuseing. I choose to have it delivered to a friends house for 99.00 and we would have to unload. as it turned out we found out by calling shipping co, that it was in port angeles wa. and not at the trucking co. in fife witch is what the tracking info said.so me and a friend went there to pick up expecting a big grate witch was suppose to weigh 256lbs. What a joke, we went to our local shipping place and it was in a huge box witch we had to cut open and I wheeled it write into my trailer witch I didn't even need, it would have fit in the back seat of a ave size car. Was not happy about that but the chipper itself is great. I was very pleased with this purchase and it worked just as advertised. The gasoline engine was very easy to start and it ran without incident for three to four hours under constant feed of oak limbs up to 2&3/4" in diameter. I did have to refill gas tank during this time but gas consumption was minimal considering the work the chipper did. The chipper waste chute would have worked better for me if the model I purchased had an option to obtain a chute that was taller which would have allowed me to feed chips into a truck bed or UTV bed to haul off. I would recommend this product to anyone. The hardware bag is missing 3 regular locknuts and the thin locknut for behind the hopper. It had two large washers that are not called for. Wrong bag? DR support is ground UPSing me the nuts. It is very disappointing that I have to go out and see if I can find a "thin" 5/16-18 locknut in order to use the machine during the next 4-5 days. Also I was surprised at the amount of maintenance checks that should be performed, such as belt tension, at 8-10 hour intervals. These require taking panels off the machine to get to parts such as the blade and the belt. The chipper arrived in perfect condition. Was fairly easy to un-pallet and set up - except for one nut on the bottom of the hopper - this could surely be improved! As for performance - the Briggs engine is very impressive, but overall I would have to say that material size is effectively limited to about 3" or less. Overall very pleased. The good thing is this chipper will eat just about anything you put in it. Now for the bad: -Assembly kit missing parts. Just washers and nuts, but still annoying. -Motor will not turn off when throttled all the way down. -After 3hrs of use I found the chipper pulley working its way off the drive shaft. The set screws and shear key were nowhere to be found. Response from DR SupportHello Matt, thank you so much for taking the time to write us a review. We are sorry to hear there were parts missing in the shipment. Please give us a call at 1-800-687-6575 so we can help you out with this. We will also troubleshoot with you to figure out why the pully is off the drive shaft, as it certainly should not be happening. Product operated exactly like advertised. Remarkable machine. Continuously chipped for six hours without a problem. Starts every time with one pull. Only improvement suggestion I have is to make the standard discharge chute a few inches higher for discharge into a double wheel wheelbarrow. Completely satisfied with product and value. Easy to put together,started right up and started chipping. Haven't tried 3 1/2 inch yet, mostly small stuff. Delivery was fast. Some of the hardware was missing (nuts), but were easily replaced. Chipping some 3" branches loaded the engine, but never stopped it. For the size it does very well and is easy to move around. So far, I have used it once, and have been impressed with my new chipper. I really like the self-feeding feature. Still learning. I fell about 25 evergreen trees and began to chip. It works great. I have put small and large (3") branches thru it with no problem. The fir bows require a little extra help, but they zip thru easily. I am using the chips to fill in beneath other landscaping. It is great to be able to complete the job a my own pace and not have to rush thru because of a rental time limit. This is a great product. So far the chipper exceeds my expectations Good quality compared to what is available elsewhere. Disappointing only that there were nuts missing for assembly. A quick call to DR however got the missing parts on the way. overall I am pleased. I really put the chipper to the test; choosing a 3" sapling cutting off the bottom four feet of trunk then feeding directly into the chipper. Though I did feed slowly, the machine did bog down almost to stall three times, but soon revved right back up and continued successfully. I wish the flywheel was heavier and the motor up a couple HP. All machines have their limits. I am pleased though. So far our chipper is working great. There was minimal assembly and it was easy to pick up from the ship to location. We have run both green and dried out wood and brush though it with very little issues. If the branch has a fork or a bend in it it will have a little trouble feeding in. First off, this chipper did most everything I asked of it. This is the first chipper I have ever used, so I didn't really know what to expect. We have 20 acres of woods in Montana, so I have used this beast for many hours on end - mainly for branches, some quite large. I didn't give it 5 stars for a few reasons. The "self feeding" should really be called "assisted feeding". I mostly had to push the branches and small trunks into the unit, but the machine did help to pull some of them in. Maybe if every branch and trunk were straight and denuded of any imperfections they would slide right in, but I live in the real world. I also don't feel this machine can chip through a 3 3/4 inch diameter trunk - I know it depends on the type of tree, but the lodgepoles and firs we have here put up a heckuva fight. It really bogged down on the bigger ones (over 3"), so I just quit trying to chew them up. Actually was measuring them at first just to see. Lastly, I had a total of 5 chute jams - mostly due to pine needles on the branches - again, I wasn't feeding in perfect specimens as per the company video. The discharge chute is difficult to remove and replace, as it is crammed very tightly between 2 sides of the frame. I would recommend a longer handle, as this chipper is quite heavy and difficult to pull without banging your feet against the bottom support. This product is very beefy and well constructed in my opinion. I use it to chew up lots of large branches and smaller trunks, and it does all of that quite well. We are using all of the wood chips on a trail - will probably take the rest of the summer to move them all! We were expecting a piece of equipment that would perform the tasks for which we ordered it. What we got was a machine that did exactly what we needed. The wood chipper chips up everything we have submitted to be chipped and keeps running strong. Starting is easy. Once it is running there isn't a lot of movement from the position it was set in. Overall the chipper is everything we were counting on it being. We are quite satisfied with our purchase. We get a lot of deadfall and trimmings on our property. Typically, we burn it, but this year opted to buy this chipper, based on usability of the mulch and DR's reputation. I was cautioned by the rep about expecting too much, and I've used industrial chippers before, so I never intended to feed a tree into the machine. I am quite pleased. Positives include reliable and sufficient power, easy starting, fairly well-balanced and light enough to move easily. A minor negative was the lack of a couple of bolts/nuts required for assembly. I would also recommend the hitch pin package. My opinion is that it should be standard for this machine as it provides some additional balance and increased mobility. I've used the machine for about 4 hours so far. The DR website advertises 'branches of up to 3.75" diameter'. That would be for green softwoods. The flywheel does a good job, but it will bog down or stop if fed too much. Listen to the engine, take it easy, wear safety gear and feed it with care. I am looking forward to many more years of mulch. This chipper is very well built and well engineered. First time I used it ran it for 2 hours with green and dried branches all just over 2" in diameter. Never slowed down. My only complaint was it was missing one of the bolts to hold the handle. I had to go fishing in my box of bolts. Muffler cracked at manifold and fell off. Bracket holding belt cover on broke. Won't stay on high speed. Vibrates like it's out of balance. Not really self feeding. It's a 800 dollar chipper at best. Sorry. I bought a refurbished unit recently on sale and did not have high expectations. But I have to admit that this is an amazing machine and was cutting through 3 1/2 + trees all day today and yesterday. After finishing I checked the blade to find that it is still in great shape. I am putting fatter wheels on it and getting the hitch to be able to go throughout my trails in the mountains. I now wish I would have bought the next bigger unit but not because of performance but thats a problem I have with all things I buy. You will not be disappointed one bit and may I suggest you getting a refurb unit as mine looked brand new. The machine came on time, was easy to assemble, started up fine and processed a lot of apple prunings over about 4 hours. The machine did not come with safety goggles as I thought. This was the only problem. It was a bit difficult judging whether I put the right amount of oil in because the oil was new and clear and the marker on the dipstick is just at the end of the stick. But I think I got it right just by putting in slightly less than the recommended capacity and assuming a small amount of oil was in the machine already. It would be nice if you had a youtube video on operating the machine emphasizing safety issues. Over the four hours of use I found myself learning how to operating the chipper such things as where to put the throttle at start (in the manual), how to stand to the side when operating, how to use the clear plastic kickback guard, how to brace the wheels to keep the chipper from rotating (it was on cement) etc. Perhaps you do not have such a video for legal liability reasons, but from a practical perspective, I would have found it useful. Assembly was easy except for one bolt which is a design error in location of the hole. Was able to install nut after discarding washer. The accessory hitch works well with my mower and Kawasaki Mule. Started on first pull. Have used chipper twice and am very satisfied with chipping results. The bolt heads near the feed hole sometimes interfere with feeding smaller branches that are very curvy. Overall a good machine. Construction is very sturdy and has a very nice paint job. Once I put it together I was able to use it the following day. I had several very large piles of brush, small limbs and vines. One to two pulls and it started right up. I like the idea of the fuel shut off valve! It took me two days to get through the piles. It did a great job on the branches and small limbs. It does not like limbs with leaves though. I learned to roll them in and slowly feed them in and out until the chipper chute was clear. Ate through the bamboo stalks and palm fronds with ease. It does seem to work easier with greener branches and limbs (except those with a lot of leaves still attached) over dried out ones. I never tried to put anything bigger than 2" to 2.5" into it. My only word of caution is to stay WELL AWAY from the muffler!! I got careless and was reaching around to clear some debris, and for only a split second touched the side of my left knee to the muffler causing second degree burns, even though it didn't even leave a mark on the pants I was wearing. I did change the oil after this first use, which I highly recommend. And don't forget to turn off the fuel shut off valve until you need to use it again. After un-crating the DR 11.5 chipper half-way up my 400' uphill driveway (where the delivery service left it...#$%#$%), I could see that it is a really well made piece of equipment! I was able to assemble most of it right there on the hill in 30 minutes, so I could get it the rest of the way up to my garage. (I also bought the pin hitch, and that worked very well with my John Deere X570 - don't forget to remove the U-shaped stand - I originally left it in place!). I haven't been able to use the chipper as yet, since the hardware bag was mis-packed and left out four of the nylon lock nuts needed to attach the feed chute. The DR technical support people were great though - I should have a replacement hardware kit in hand within a day or so. The rest of the machine is complete, so I was able to fill the engine with oil and gas and test that part of the machine - and it started on the first pull! I can't wait to try it out on the brush piles surrounding the forested portion of our yard! The Chipper operates beautifully and was easy to assemble. However, it was short one bolt in the hardware kit. The chipper was easily assembled with the exception of one area between the chipper chute and the panel board where the nut was hard to screw on because of the tight space. Once the nut had been filed down so it would fit, the assembly was completed. We have actually used the Chipper and used the shavings as mulch for our decorative garden,which is going to save me a lot of money. So far, I am pleased with the Chipper's performance and look forward to many years of using the Chipper. Time will tell if it will hold up year after year, but I feel this is a good product and am anticipation no troubles in the future. The machine arrived well-packaged and crated. It was easy to remove from the crate and assemble. One of the feeder chute welds made it difficult to insert the bolt, but we were able to work around that. After adding gas and oil, it started right up. After 3-4 hours of use, I noticed gas sloshing out of the tank and found that the two bolts holding the tank to the machine had vibrated out. Fortunately we we able to find them among the leaves and debris on the ground as they were a special shoulder bolt that would not have been easy to replace. I added Loctite to the bolts and reinstalled them -- not problem since, but it is a good reminder to check the tightness of all the fasteners on a routine basis. We have about 15 hours on the chipper and other than the minor assembly and loosening bolt issue, it has performed like a champ. I was concerned that it may not be powerful enough for our needs, but that hasn't been a problem. We are cleaning up 20 acres of oak woods, and have been chipping a mixture of newly cut branches, fallen and semi-rotten branches and some old/dry branches. We have about 15 hours on the machine and have chipped over a dozen large piles of accumulated branches and I continue to be very please with the performance of the chipper. I am amazed at how quickly it will chew through even large (3.5") diameter hardwood branches. The really dry/hard ones sometimes slow the rpm a bit, but it comes back to speed quickly. Most smaller branches don't ven slow it down. We've fed though some smaller saplings and larger pine branches and it shreds them very quickly. Overall, I am very happy with this machine and have no regrets on the purchase. We bought the hitch kit so that we could pull it behind a UTV which works fine. On minor aggravation is that the handle bar to assist in moving it manually (very easy and handy) has a plastic hand grip that easily (and unexpectedly) slides off when moving the machine which could easily cause a trip/fall. I was surprised that wasn't more permanently attached and will probably be adding some glue to keep it in position. Other than the minor issues noted, this has been a great machine. It is well-built and should last for years to come. One unexpected bonus, is the fuel efficiency - it will run over two hours on a tank (3/4 gallon) of gas. I have been running 90 octane ethanol-free fuel and it starts on the first pull every time. Excellent machine, easily takes care of branches up to 3.5 inches. Look forward to many years of service. I have the 11.5 Premier Chipper from early 2015. I've had 10s of hours of experience with it and am happy with the heavy duty and safe design. First, safety. I looked at older used chippers - both DR and other brands. I have to say that DR Power has this one right. The hopper seems to be intentionally designed to prevent any accidental injury. It's deep enough that even if you push a piece of brush in a bit, your hands can't come anywhere close to a danger area. The large hopper also serves to contain stubs and keep them from bouncing out. Older machines I've seen have much shorter hoppers and it wouldn't surprise me that some short ends could come flying back out at you. Even if you were to accidentally trip on a root and stumble toward the machine, you can't reach anything with your hands that will cause injury. The metal is equally thick such that stubs in the hopper flopping around don't begin to cause any problems with dents in the material. This chipper handles the material thickness it claims although a little more care and handling (rotating, etc.) is required with the thickest limbs. As far as the self feed nature, it works in many cases but be prepared to push, especially with dry limbs. Green brush feeds better. Don't expect true self feeding and you won't be dissapointed. I haven't had any problems with the machine and would recommend it to home/land owners that have a lot of brush to dispose of. Its easier and more efficient to tow the machine to each brush pile and turn it into chips than it is to move the brush and either burn it or haul it away... far easier! It will take time to do the chipping and its not as fast as a large towed commercial chipper but this one stores in a lot less space and is affordable. I'd buy it again without hesitation. This is a great little chipper! I have 5 acres of untouched woods. Lots of small saplings to remove and this CHIPPA does a great job helping me clear up my property. Thanks DR. This will make me a happy owner! The chipper works very well. I used it once before I noticed that it had no grease fittings on the shaft as shown by the manual. I contacted DR and was sent fittings and was then able to grease it. The bearings seem fine. The unit chips well and feeds itself well. Works great if the branch is over 3 inches you have to feed it a little slower or it will tend to stall the engine down some other then that the best homeowners chipper I ever used! Great small property chipper. Has handled everything under 3.5" I have given it. Has not bogged down once. Makes uniform 1" to 1.5" chips. Self feed is great; pulls 8' - 10' material with no problem. Far superior to the chipper/shredders available at the box stores for more than half the price of this unit. It has a larger capacity and is built to last. So far one of the best equipment purchases I have made. Side note: I used the free shipping to a freight terminal. Nothing could have been simpler. They loaded the chipper pallet/crate into my pickup for me. At my home I took the crate apart on the truck and easily rolled the chipper off. Assembly consisted of attaching the hopper and the moving handle. Took about 30 minutes. this product has worked very well since I have received it. I chip mostly smaller branches and brush into mulch. only two issues. 1st my unit was rather poorly assembled. I had to remove one of the tubes from the housing and cut it to the correct length as it was holding the side of the chipping chamber open in one spot and would have let material escape. also found not all bolts and nuts were tight and the paint chips off at the edges of panels. 2nd, one must be careful feeding any dry hard wood near the three inch size as it will stall the engine. over all I am very happy with this product and its performance and I would buy again. Response from DR SupportThank you for your feedback. Someone from our tech support department is going to contact you by phone so that we can make sure your machine is in good working order. We want you to be happy with your purchase - your satisfaction is important to us. Thank you for choosing DR Power and you'll be hearing from us soon! I shopped a long time for wood chippers and always kept going back to the DR Chipper. I should have ordered this chipper a long time ago. It handles good size limbs with ease. The chipper is very manuverable. Starts easily and does a great job. Unit is shipped well, installed the feed shoot on the chipper, I noticed while moving the chipper around my shop that the chipper housing will come in contact against the oil dipstick on the engine and flex it back, nothing is lose, the problem is the base that the engine and chipper is mounted to flexes ,it needs a cross member under the plate, I installed a brace from one of the bolts that you bolt the feed shoot to the chipper down to the rear edge of the base plate and that took care of the flexing , made my own hitch to pull it around with garden tractor, used it for a hour, it works very well, took everything I could put in it, could use a little more power on the 3 inch stuff but is a good unit,, I would buy again. I am in the millwork business. I've had this chipper for 6 months. It starts every time and has about 40 hours on it. It just keeps on working. I have used it around the warehouse chipping up chainsawed branches. I also use it to clean up the rip saw waste. So far it's worked without a hicup. I've also never changed the knife and its still sharp and works fine. Not a problem with the chipper so far. Never had a wood chipper before but it is well worth the price. Will have to see if it holds up. The smoothest chipper and easiest to use. Starts right away. And no bogging down with a load of twigs up to 3 1/2 limbs. Would recommend to anyone. Love it chips anything that goes in the hopper cleans up tree limbs and Bush quick. This is one of the better products I have bought for my 10 acres. Only problem with it is I waited too long to buy it. (LOL) With 10 acres to clean up this make the job 100%easies, and it goes through limbs like butter, giving me some much needed mulch for my plants. Have used chipper for four hours. Easy enough to move around by built in handles - like a wheelbarrow. Just what I expected & made in USA!!!! So for the wood chipper has worked very well. However, the engine is causing some problems. The muffler guard bracket has broken and 2 of the bolts that hold the gas tank in place have vibrated out. since the bracket assembly sits under the fuel tank it looks like several parts will have to come off to fix it. It looks like a Briggs & Stratton problem. Response from DR SupportWe're sorry you have had some engine/vibration issues. Thanks for letting us know about them though! We will contact you to get these things straightened out. I have several DR products and have been pleased with them... HOWEVER, I cannot recommend the DR Chipper because of the Briggs and Stratton motor. I have about 3 hours on the machine and set it up with Stabil fuel stabalizer in it. What I thought was going to be a few hours of clean up turned out to be about 5 hours of pulling on the engine. IT ABSOLUTELY REFUSED TO START. It would do a quick start with starting fluid, but nothing else. The technician was nice enough, but in spite of the fact that the machine is still in warranty, he had nothing to offer. This will be my last DR. Response from DR SupportWe’re sorry that you are experiencing a problem with your Chipper engine. We appreciate you taking the time to post a review about it. Even though you have used a stabilizer, it sounds like you have a blockage in the fuel delivery. You may have a particle (metal, etc..) that a cleaner like Sea Foam can’t break down? If you haven’t, please try blowing out the passages with air. We’ll get a hold of you to follow up on this. 27 people found this review helpful. I am quite satisfied with my chipper. It performs as I expected. Would recommend the addition of a "pusher" stick for those stubborn twigs and leaves. The chipper won't pull them in. I'm using a piece of lath and that works fine. Over all, it's a good machine and I wouldn't hesitate to buy another. Does exactly what I bought it for. I bought the chipper to clean up an over grown wooded area on my property and it is doing just what I bought it for. Even better, I have been able to quickly clean up after the really bad wind storm we had last week. My neighbors still have piles of branches. After debating on the Chipper/Shredder or the 11.5 chipper, I ordered the 11.5. Thinking I made a mistake I was just ready to call and change my order when I received notice the 11.5 chipper had ben shipped. After using it HARD for three weeks, two huge brush piles, trimming two dozen pine trees, cutting down three huge pines and chipping them, and cleaning up shrubs that were badly overgrown I now realize the 11.5 chipper was exactly the correct choice. I have never been a big fan of Briggs Engines but this one started on the first pull and has continued to start every time. To date I have had to preform no maintenance or repairs although I think its about time to change the blade. I purchased an extra and have yet to install it. I also purchased the two attachment. The only con's so far is the difficulty in greasing the main bearing on the motor side, it appears you have to remove the shroud to get to it. Since I live in the Nebraska Panhandle I had to pay an additional fee for delivery as ABF Freight doesn't have a Terminal for over several hundred miles. Would I recommend it? I don't see how you can have three plus acres with heavy trees and brush and not own one. We have severe burn restrictions here and waiting until next winter when we have snow on the ground wasn't an option. The 11.5 chipper was and is the best choice for me. 21 people found this review helpful. Works as advertised. I use this several times a year to do leanup of either storm damage or pruned trees. I am very pleased with the chipper so far, I have used it quite a bit already and so far I am very pleased. It handles anything that fits in there and does it quickly. It is hard to get branches through that have a lot of leaves because they do not gravity feed and can clog the opening but you just adjust how you feed it knowing this. I did have a problem with the muffler, it broke it's weld at the manifold after only about two weeks. When I called, a very proficient and professional agent assisted me with making sure they knew exactly what part I needed and I received the part in a couple of days and it was easy to change. I am very happy with it and I like all of the wood chips that I have now to spread around my trees and landscaping. It beats the ugly and messing burn pile! I am so proud of my DR Chipper. Its the best money I ever spent. And I don't hesitate to tell people what a great piece of equipment it is (along with my RotoHog tiller purchased at the same time). The quality, tuffness, ease of use, its all exceeded my expectations. I've seen and read about DR Power Equipment for years, but never had the money to invest. Then when you offered your 0% Interest Special, I couldn't resist. Great purchase! And made in the USA -- even better! This chipper has exceeded my expectations - it gobbles up all branches up to 3.5 inches and shreds them easily. I like the ease of transporting the chipper from place to place - the tires are big enough to roll over semi-rough terrain. Th large gas tank allows long use without refilling. I burned on a brush pile for years but taking limbs to one spot got old. This is a great towable solution to the limbs. Easily chips 2-3" limbs. Side limbs over about 1/2" sometimes stop the feeding process. I just keep a saw around to take those off. Much faster than chipper shredders from department stores. I did entire 20" sumac in one pass in well under a minute. Easy to assemble well balanced for transport. This thing means business! We live on 3 wooded acres with lots of dreaded buckthorn, so we're never at a loss for branches and limbs to chip. The 11.5 will power through just about anything and it'll do it fast. The RPMs drop a bit when going through the thick stuff, but all you have to do is feed it through a bit slower. I've got 5 hours of run time so far, and I like it more every time I use it. It was super easy to put together and you can move it very easily too-- even up and down the steep hills we have. The wide mouth, elevated discharge, handles, and self-feeding attributes really make using this a snap. Oh, and it is so easy to start. One pull. Really. I spent a lot of time shopping around and this was by far number 1. It may cost a bit more, but it is worth it. Why buy something that you'll only have to replace or fix? One last thing-- if you're mostly going to chip wood and not leaves or mulch, don't bother with a chipper/shredder. Go with a dedicated unit like this. You won't be disappointed. i have really liked this product because it helps me get a lot of my jobs done and is also very easy for me to use. My surprise with my DR chipper is the benefit of the wood chips. I purchased my chipper about five years ago from DR.I wanted to quit burning my brush, or having to haul it off. I now have used the chipper many times and for hours at a time around my property. I have not had any problems with the motor, or chipper and it has eliminated all my burning and hauling. At first I was not even considering the wood chips I would have, but now it is the best part of chipping my limbs. The chipper is easy to use and the chips are nice on our flower beds. Well built machine that didn't quite do the job. I own your 11.0 Premier Rapid-Feed Chipper. I was supposed to be able to chip up to 3 1/2" limbs but found the machine tended to bog down when I chipped anything over 3". It did work well with the smaller stuff although the "Rapid-Feed" in its name is a little deceiving. I found it almost always required a little encouragement when feeding branches into the machine. It is a well made machine and alwasy runs when I want it to. 18 people found this review helpful. This is a sturdy piece of equipment. I love the convienence of being able to chip any brush that I may have laying around. The chipper is very sturdy and powerful to do the jobs that I need. ANYONE with as many old trees as we have NEEDS this!! I used to spend more time with branch removal than I did mowing the lawn. Now we even have a flower bed made from chips with a rose!! Chipper and I have spent agreat deal of time together and I love it. 17 people found this review helpful. unit has given me good, reliable service for several seasons. Units starts easily every time. The unit is easy to use and accommodates a large variety of limbs and brush. The blade broke once and was quickly replaced at no cost by DR. I recommend close inspection each time unit is used as hardware does tend to loosen with vibration. Overall quaity is good, although it appears that a crack may be developing in one face. Great product. Works exactly as advertised. Excellent service at your Delaware location. I was given a chance to test the product in advance and it was loaded in my truck filled with gas and oil, ready to start chipping when I returned home. My husband and I use this to help chip brush and small trees from our wooded area and use the chips for our paths as well as for landscaping in our yard. It has come in handy when we have had blow down, helps with keeping our paths from eroding, as well as keeping the weeds from around our trees, bushes, and plants in our yard, which makes this very eco friendly. It has saved us money from not having to buy chipped/shreaded wood from the stores. This was a very good investment for our property. This is one of the best buys for the money. It is durable and portable. The only thing i would change is that it should have some sort of sack attachment that could collect the chips to easily move them and it would keep the area where you are chipping cleaner. I bought this chipper used (1 yr old) previous owner had all the paperwork and an extra cutter. I ordered an extra also from DR.I'm very happy with it. This product deivered the quality I was looking for when purchased. I received a product I expected to be quality and it delivered the quality I expected! I purchased a RECONDITIONED 13hp CHIPPER. This item was not on your selection list for review. This chipper cleaned up my yard after a tornado went through our area on May 31, 2011 when we lost over 30 mature trees. We not only cleared our yard in record time, but we got beautiful mulch for our flower beds. This was a great deal all around. when added to my four wheeler, it makes it very portable and can go just about anywhere on the property. It has been a great asset for about 10 years noiw. One of my best yard tools I have not had to burn or go to the dumps for the past 10 years. Q.How can this model handle branch sizes larger than other brands with the same engine size? Other than the larger chute, other chipper makers offering this model engine cannot claim to handle branch sizes this size. Nor are they as expensive--with comparable models being about 20% cheaper. What makes the DR different? A.The DR 11.5 Premier Rapid Feed Chipper has a 34 pound flywheel that is spinning at 98 MPH that provide's the extra chipping force. They are built on a 10 gauge welded steel frame with a 7 gauge chipper box. Please contact us if you have additional question's. 92 people found this answer helpful. Q.Is it easy to change the cutting blade? A.Yes. There is an access panel that you open to expose the blade bolts and nuts. Also, the owners manual has full instructions with pictures showing how to change the knife. Thank you. 82 people found this answer helpful. Q.With no tractor, how do I move the 11.5 premier around? I don't have a tractor. Can you move the 11.5 hp premier around easily by hand? 61 people found this answer helpful. Q.What is the distance from where the chips are shot out of the chipper to the ground? O The 11.50 Chipper is in question. A.From the top of the Chipper chute to the ground, it is 37". 56 people found this answer helpful. Q.Does the "parking leg" fold up when pulling with a lawn tractor? With the machine setting level in the towing position, how much ground clearance is there between the "parking leg" and the ground? A.The 11.50 Premier Chipper transports easily by hand, using the handles that are built into the hopper. You can also use it with the optional Pin Hitch Package for easy towing with a lawn tractor or ATV. The stand or "parking leg" does not fold up. When you want to tow the chipper, you will need to remove the stand from the chipper by removing 2 bolts and locknuts with 1/2" wrenches. The ground clearance is 5-1/2". Thanks for your interest in the Premier Rapid Feed Chipper. 44 people found this answer helpful. Q.Shipping, pick up at freight company loading dock? I plan to buy the 11.5 Premier in a few days, I need to be able to pick up the item at the freight companies loading dock because I have no way to unload it at home. Shipping companies usually will load the items into my truck and from there I can take it to my destination and slide it out of the truck onto the ground and assemble... Can you do that? 42 people found this answer helpful. Q.How many cc's is the engine? A.The 1150 series Briggs and Stratton engine used on this machine is a 250cc 11.5ft-lbs gross torque engine. The URL below is a link to this engine on Briggs and Stratton's website. http://www.briggsandstratton.com/us/en/engines/other-engines/1150-series-other For more information on this machine, you can give us a call toll free at 1-(888) 550-0062 Monday - Friday from 8:00am - 6:00pm Eastern and Saturday from 8:30am - 5:00pm. We will be happy to assist you and look forward to hearing from you. 27 people found this answer helpful. Our entry-level rapid-feed chipper can handle branches up to 3½" thick. This chipper is built to be on the move and can be transported around your property by simply using the handle built into the hopper. Large pneumatic tires roll smoothly over the ground for easy, comfortable transportation. We also offer a pin hitch package for easy towing with a tractor or ATV as an optional accessory. Thanks for your interest in our 11.50 Premier Chipper! 25 people found this answer helpful. Q.Is this chipper can handle palm branches? A.The DR 11.50 Rapid-Feed Wood Chipper will work great with the palm branches, simply feed the stem first. Please contact us if you have additional question's. A.The DR Premier Rapid Feed Chipper can be towed with a pin hitch if you purchase the optional pin hitch kit, item # 24409. If you prefer to use a ball hitch, it is available on the Pro or Pro XL model with the optional road tow package, item # 24402. These chippers handle up to 3" and 4" diameter branches respectively. Thank you for your inquiry. 17 people found this answer helpful. Q.Will this machine do "secondary" shredding on tree service waste cuttings? A.The DR Chipper's are not designed for a "re-grind".I would recommend that you take a look at our Chipper/Shredder's for the type of work you are describing. Please contact us if you have any more question's. 8 people found this answer helpful. Q.What size chip does it produce? What horsepower is the engine? A.Thank you for contacting us. The DR 11.5 Premier Chipper produces chips of different sizes, depending on the type of wood, is it fresh cut branches or seasoned. It will also depend on how sharp the knife is. As the knife dulls, the chips will get smaller. Many engine manufacturers no longer rate their smaller engines by horsepower. They rate them by foot-pounds of torque. Rating by foot-pounds of torque is a trend that is spreading throughout the industry because it is a more accurate measure of power. All of our machines are fitted with engines that are more than powerful enough to do the work they were designed to accomplish. 7 people found this answer helpful. Q.Cold Starting ... Candian dealers ...The chipper will be kept in a cold shed. Is it an easy start (manual) in winter? Do you have dealers in Quebec or Ontario (I live in Ontario)? If so, where? If not, how do I get one shipped to Ontario? A.The DR Chipper start's very easily in the cold weather, I recommend a fuel additive for easier starting in the winter month's. Here is the web page with the list of our DR Canadian Dealer's. http://www.drpower.com/shop.axd/StoreLocator?keywords=dealer You can also give us a call at 1-888-550-0062 and a sales rep will assist you. A.This model is manual start only. You may like the 16.5 Pro. That model has an electric start option. 4 people found this answer helpful. Q.Does the discharge chute come standard or is it extra? How much is the tow bar and how do you buy it? Q.Does the 11.5 model have the option of adding the high discharge chute? A.Thank you for you question. The 11.5 Chipper is not compatible with the optional extended discharge chute. From the ground to top of the discharge chute is 37". This allows you to easily collect the chips in a wheel barrow or onto a tarp. Please let us know if you have any other question. A.The high-carbon/ high chromium forged alloy D2 tool steel that our chipper knives are made of is exceptionally strong and has an excellent edge holding ability. This means the knife has the potential to be used for 20 hours without having to be sharpened. The knife can also be easily removed and taken to a service center for sharpening. A spare knife can be purchased by calling our sales team at 1(800)687-6575. Q.Can this machine be used as a shredder also ? Q.11.50 Chipper: I am trying to determine if I can get the chipper into my basement thru a passage door rather than clutter up the garage with another piece of equipment. I would remove the hopper if needed. What is the dimension across the outside of the wheels? Is this the 32-1/2" dimension referred to in the spec sheet? This would be max width of unit with hopper removed. What is the dimension of the Frame, Base in the axle direction? Q.What would the engine rating/derating be at 7000' elevation? A.For every 1000' above sea level the engine will lose about 3%. The 11.5 would be about a 9.00 at 7000'. You may want to go up a size? Q.How long is the original warrenty and what does the extended warrenty cover? A.Our Rapid-Feed Chipper comes standard with a 2 year warranty for residential use. You do have the option of extending to a full 5 years at an additional cost. The extended warranty covers the same as the original warranty. Labor, non-wearable parts and shipping of those parts. Q.Do you have a chipped that is pulled by hand. A.Hello Frank, There is a handle located on the side of the unit that allows you to pull the Chipper by hand. The unit weighs 164 lbs, making it easy to hand tow. The pin hitch package is always an option as well. 1 people found this answer helpful. Q.What size of motor does this chipper have? A.Thank you for your question. 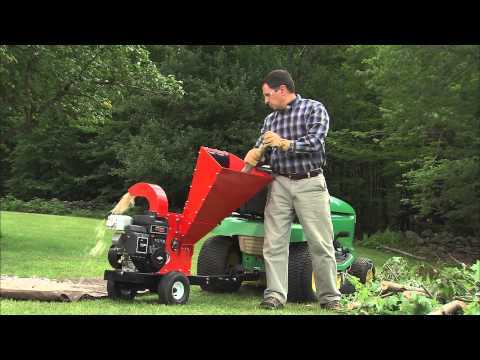 This Self-Feeding Wood Chipper has an easy starting OHV Briggs and Stratton engine that delivers 11.5 ft lbs of torque for smooth chipping action, with a chipping capacity of 3.75". Please let us know if you have any other questions. 0 people found this answer helpful. Enter your zip code below to see a listing of your closest trucking depots. You'll be able to select the depot during checkout.